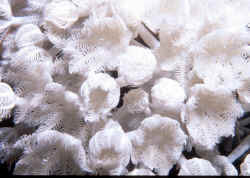 Genus Anthelia Lamarck 1816: Clusters of polyps all arising from a united stolon base that is soft, ribbon-like. Polyp pinnules in rows of 1-4 in number; slightly contractile, not retractile; some don't even respond to touch. 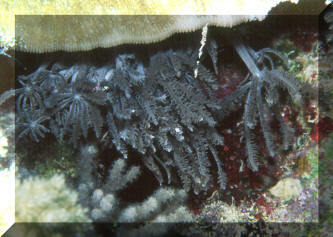 Unlike Heteroxenia and Xenia species, Anthelia colonies branch at their base of attachment. Anthelia sp. (perhaps A. flava) N. Sulawesi.